The precise route of TransCanada’s Keystone XL tar sands pipeline remains shrouded in mystery. 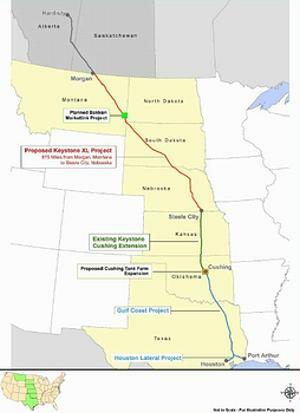 Of course, both TransCanada and the U.S. State Department have revealed basic Keystone XL route maps. And those who follow the issue closely know the pipeline would carry Alberta’s tar sands diluted bitumen or “dilbit” southward to Port Arthur, TX refineries and then be exported to the global market. But the real path is still a secret: the actual route of KXL is still cloaked in secrecy. Case in point: the travails of Thomas Bachand, Founder and Director of the Keystone Mapping Project. His experience with TransCanada was even worse. Due to lack of transparency on the part of President Barack Obama’s State Department and TransCanada, what was once merely an ambitous photo-journalism project has morphed into a full-fledged muckraking effort — and a Freedom of Information Act (FOIA) request battle royale — that’s now lasted about a year and a half for Bachand. The State Department still has yet to give him the goods. Why the long delay on such a seemingly straight-forward request? “I have been told that the main obstacle to my FOIA request with the Dept. of State for the…Keystone XL is that the information is ‘politically sensitive,’” Bachand explained of the situation in a June 26, 2012 blog post. Bachand believes even the most ardent advocates fending off KXL are missing the forest for the trees on the State Dept. KXL Supplemental Environmental Impact Statement (SEIS). The SEIS was penned by Environmental Resources Management (ERM Group), a dues-paying member of the American Petroleum Institute (API) which said KXL will have negligible climate change impacts, along with two other industry-tied contractors. API has spent $22 million lobbying on behalf of its members on KXL and tar sands since its initial June 2008 proposal, on top of the cash it has spent on its relentless public relations and advertising efforts. As of now, U.S. citizens aren’t even privy to information as basic as what water bodies the pipeline crosses, Bachand says. As seen in Mayflower, AR — when tens of thousands of gallons of tar sands crude from ExxonMobil’s Pegasus Pipeline spilled into Lake Conway from a pipeline few even knew existed until the latest “dilbit disaster” — knowledge is power and lack of it vice versa. Not knowing the exact route of the pipeline leaves impacted communities unable to anticipate threats to waterways where their local knowledge would be invaluable. Bachand also believes that President Obama’s statement about deciding the fate of KXL exclusively on its climate change impact — at the expense of numerous significant ecological impacts — is foolhardy. Although FOIA battles over basic KXL details were never the initial intention of Bachand’s project, he is now committed to work on the project for months, if not years to come. Bachand sees KXL as a climate change symbol — and as he’s learned, a symbol of broken democracy — with much significance beyond the immediate pipeline itself.